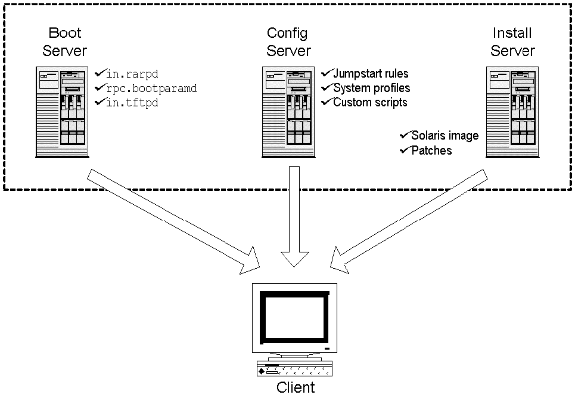 Lets play around the Solaris virtualization technology by Oracle (SUN) known as Jumpstart - a network installation tool-set used by Solaris for virtualising the SPARC/x86 hardware for Solaris operating systems. Ever imagined on how to take OS snapshots for Solaris considering the fact that its mostly deployed on SPARC architecture ? How to remotely deploy Solaris OS over the network ? How to backup all the operating system data from one Solaris machine and deploy it over another machine ? How can we have an automated mechanism to do all the above steps ? Well Jumpstart is the answer to your questions. Lets try to understand the Jumpstart scenario for Intel (x86) based machines. Note : You don't want other machines on your VMware setup to boot from Jumpstart's DHCP server and mess up your critical environment, hence create a virtual switch to isolate your Jumpstart setup. Setup two machines with Solaris 10. While installing Solaris 10 make sure that you select "Entire Group" option so that all packages are installed. If you are using a virtual switch to isolate your environment you will need to setup a DNS server also using the DNS packages for Solaris.The DNS machine can be of any flavor windows or linux. # on entering init state 3. # the very first entry to this file. Added “Locale” macro to dhcptab. Added server macro to dhcptab – galdospr. Added network macro to dhcptab – 10.164.5.0. This was actually really helpful. Nicely laid out (i like the drawn-out picture too). Thanks.